The Cheese for Dummies online bookstore is here! A major haul in Colorado’s Lizard Head Wilderness. Those are not my hands…I may have eczema, but not man-hands. Ever since I wrote a report on mushrooms in the fourth grade, I’ve been obsessed with fungi in all its glorious permutations. I spent many childhood hours tromping around after a rainfall, searching for elusive species. Yet, typical of my finicky palate at that age, I refused to even consider actually eating a mushroom. The horror. Thankfully, things change, and some gluttons are made, not born. I now enjoy eating wild mushrooms as much as I love foraging for them. 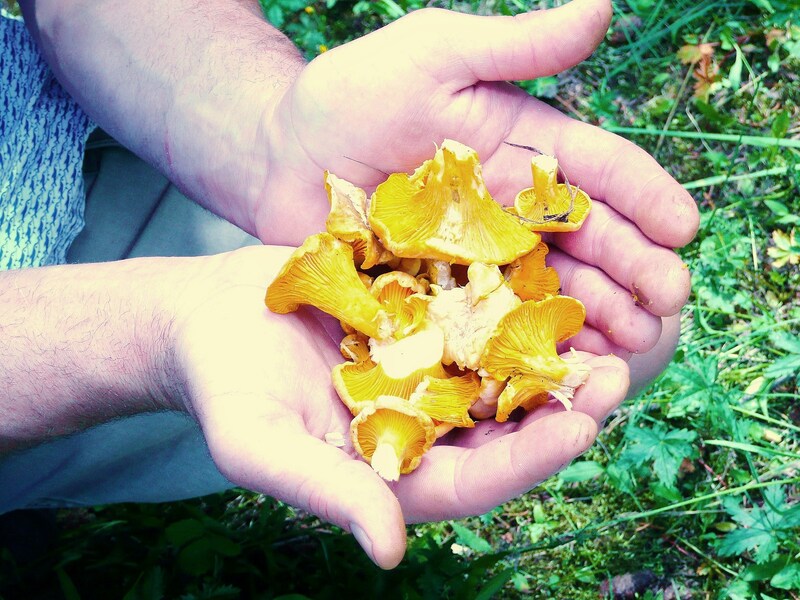 Although this recipe long predates an epic chanterelle harvest I did in Colorado’s San Juan Mountains, it’s still my favorite way to showcase these meaty, woodsy-tasting golden mushrooms. Hello, autumn. Heat a sauté pan over medium-high heat, then add 1 tablespoon unsalted butter and the olive oil. When butter is foamy, add chanterelles and cook until golden and fragrant, about 5 minutes. Important: the first few minutes of cooking, the mushrooms will release their liquid- you must keep cooking until the liquid has absorbed and mushrooms begin to brown. Add remaining half tablespoon butter, and sauté shallots and thyme with chanterelles for 1 minute. Add potatoes to heat through, being careful not to break them up as you stir. Remove from heat. Allow salad to cool in large bowl for several minutes, then add Champagne vinegar, more olive oil, if needed, and salt and pepper to taste. Garnish with shavings of Parmigiano-Reggiano. Serve warm.